Hootsuite: Among the best of breed. How to manage the torrent of social media conversations — and increase your productivity! One of the things we often hear from nonprofits and social enterprises is: How do I manage the torrent of social media conversations coming at me? When selecting a dashboard for personal or professional use, you should consider such items as cost, analytics and which social networks they support, among other things. Our list is meant to feature some of the breakout social media dashboards in the space and highlight their distinguishing features to make the selection process a bit easier. 1Threadsy is an intuitive, easy-to-use dashboard that allows organizations to connect through multiple email accounts as well as Facebook and Twitter. Free to use, Threadsy is great for managing your nonprofit or business’s brand from one clean dashboard across the big names in social media platforms. With no fees and no downloads, this service should make a splash in the space for both personal use and use by your organization. 2Haven’t heard of Myweboo? That’s OK. This upstart startup invites users to discover, browse and read popular streams and share them with friends and followers. You or your organization can choose from a wide variety of “applications” to connect to and stream to a dashboard from categories like news, social, fashion, photo and video. 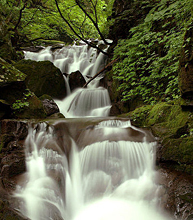 These streams can be viewed together of filtered from “My Dashboard” and then easily shared via Facebook, Twitter, LinkedIn, Flickr, Delicious and other networks. You’re in complete control of which sites will make up your dashboard. Free to use, Myweboo is run by an appealing brother-and-sister pair of young tech stars. 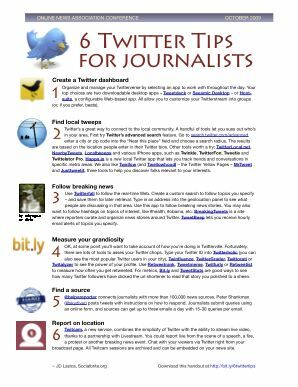 I‘ve produced two new printable handouts for the annual conference of the Online News Association this weekend: 6 Twitter tools for journalists (PDF, also at http://bit.ly/6twittertips) and 8 ways to use social media in the newsroom (PDF) — see the accompanying post. 1Organize and manage your Twitterverse by selecting an app to work with throughout the day. Your top choices are two downloadable desktop apps — Tweetdeck or Seesmic Desktop — or Hootsuite, a conﬁgurable Web-based app. All allow you to customize your Twitterstream into groups (or, if you prefer, beats). 2Twitter’s a great way to connect to the local community. A handful of tools let you suss out who’s in your area. First try Twitter’s advanced search feature. Go to search.twitter.com/advanced, enter a city or zip code into the “Near this place” ﬁeld and choose a search radius. The results are based on the location people enter in their Twitter bios. Other tools worth a try: TwitterLocal.net, NearbyTweets, Localtweeps and various iPhone apps, such as Twinkle, TwitterFon, Tweetie and Twittelator Pro. Happn.in is a new local Twitter app that lets you track trends and conversations in speciﬁc metro areas. We also like Twellow (and a href=”http://www.twellow.com/twellowhood”>Twellowhood) — the Twitter Yellow Pages — MrTweet and Justtweetit, three tools to help you discover folks relevant to your interests. Fortunately, there are many applications (both desktop and web-based) to help you organize your followers and conversations on Twitter. One such tool is Seesmic. Below are three videos I created for folks who want to learn how to use Seesmic.